Mary Call Luther lives in Appalachia, where the lilies bloom. Her mother, Cosby Luther is deceased and her father, Roy Luther, is very ill and not far from death himself. As sharecroppers on land belonging to Kiser Pease, Mary Call's family needs to be able to continue working in order to keep a roof over their heads. Without parents to rely on, Mary Call takes on the role of head of the family, looking after "cloudy-headed" older sister Devola (whom Kiser wishes to marry, despite Roy Luther's fervent objections), younger brother, Romey, and younger sister, Ima Dean, and putting them to work taking care of their home and learning to "wildcraft" using the plants that grow on the nearby mountains. As their situation becomes more and more dire, however, Mary Call finds herself buckling under the pressure even as she remains determined to keep all the promises she has made to her father. 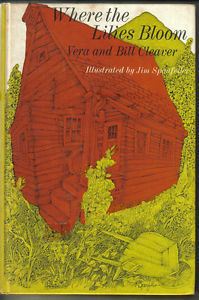 My husband read this book before me, and I watched the 1974 TV movie with him before deciding to read the book myself. I ordinarily try to avoid doing that, as the filmmakers' interpretation of a book can so easily taint the reading experience, and I prefer to imagine the characters myself rather than envision actors' voices and faces as I read. In this case, though, it really didn't matter much, as the film remains extremely faithful to the book (with a few exceptions), and reading this book is about much more than just the plot. Authors Vera and Bill Cleaver are masters of characterization. This is not a long book (176 pages), but Mary Call is as well-developed as any fictional character can be, and the difficulties she faces as the hardships pile up around her give the authors many opportunities to show the depth and breadth of their knowledge of her mind and heart. The authors are equally adept at writing engaging and meaningful description. The language they use to conjure the Applachian mountains, Kiser Pease's land, and the Luther family home itself is beautiful, and though it is often poetic, its meaning is never obscured by too much purple prose. This book reminded me a lot of many of my favorite titles by Betsy Byars, who often writes about strong young characters facing down seemingly unbeatable odds. The Cleavers have their own style, however, and this book is probably more memorable to me than any Byars book I have ever read. It's just such a different story, with such a real and sympathetic main character, and though much of the story isn't happy, it still manages to inspire and touch the reader and to impart a message of hope. A great story, not to be missed by readers young or old.